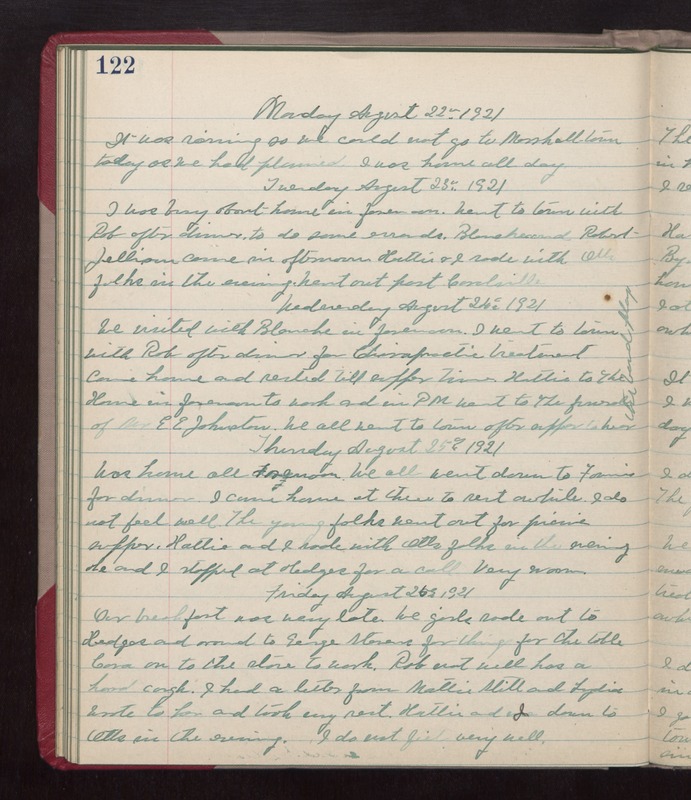 Monday August 22nd 1921 It was raining so we could not go to Marshalltown today as we had planned. I was home all day. Tuesday August 23rd 1921 I was busy about house in forenoon. Went to town with Rob after dinner to do some errands. Blanche and Robert Jellison came in afternoon. Hattie & I rode with Otts folks in the evening. Went out past Coralville. Wednesday August 24th 1921 We visited with Blanche in forenoon. I went to town with Rob after dinner for Chiropractic treatment. Came home and rested till supper time. Hattie to The Home in forenoon to work and in PM went to the funeral of Mr E E Johnston. We all went to town after supper to hear the band play. Thursday August 25th 1921 Was home all forenoon. We all went down to Fannies for dinner. I came home at three to rest awhile. I do not feel well. The young folks went out for picnic supper. Hattie and I rode with Otts folks in the evening. He and I stopped at Hedges for a call. Very warm. Friday August 26th 1921 Our breakfast was very late. We girls rode out to Hedges and around to George Stevens for things for the table. Cora on to the store to work. Rob not well has a hard cough. I had a letter from Mattie Stitt and Lydia. Wrote to her and took my rest. Hattie and I down to Otts in the evening. I do not feel very well.